It’s finally Friday, South Florida – and NBC 6 has the stories you need to know for the end of the work week. Weather wise, a drier morning will give way to a wet afternoon and evening for much of the area with high temperatures near 90 degrees. Michael is now a post tropical cyclone but it's still expected to impact parts of the east coast for much of Friday. Power outages are still a problem from the panhandle to the Carolinas. NBC 6’s Willard Shepard is in the panhandle for continuing coverage. A GoFundMe page has been set up for the 11-year-old girl from Georgia killed during Michael. Officials say Sarah Radney died when she was struck in the head by a metal carport used to park boats. Her aunt set up the memorial fund account, which has raised more than $3,000 as of Friday morning. Some residents in Brickell say they're not happy after recent work done by the city added artificial turf to portions of a 10-block stretch of Brickell Avenue. 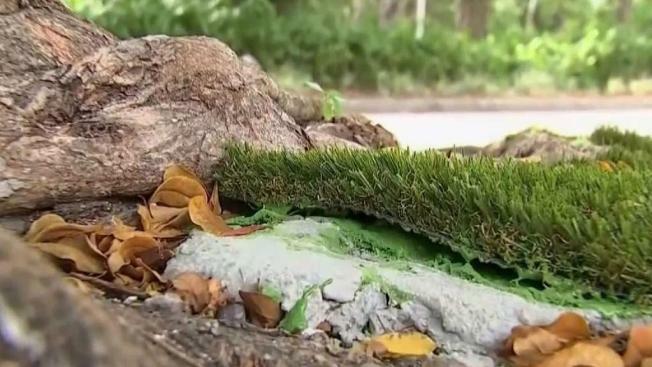 The turf that was installed around trees was meant to be a beautification project but many who live in the area think it's anything but beautiful and they've been organizing efforts to get rid of it. According to the Mason-Dixon poll conducted forsister station Telemundo 51, Republican candidate Maria Elvira Salazar is leading 44 to 42 percent over Democrat Donna Shalala among people who were asked who they would vote for with a margin of error of +/- 4 percentage points. You can watch the debate between the two candidates as well as Independent candidate Mayra Joli this Saturday on Telemundo 51 at 1 p.m.
Do yourself a favor: tonight just before 7 p.m., turn off your lights, get cozy on your couch under a blanket and tune into 6 In The Mix’s special. Johanna Gomez and Jen Herrera get sucked into the upside down. You can also watch the entire show on our NBC 6 YouTube channel.